Friday is traditionally homemade pizza night at our house, but last night was pizza with a twist. 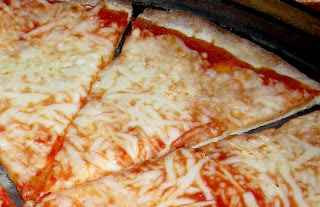 Husband Walter is my pizza man, and I love his simple from-scratch sauce and the thin crust he makes from a mix. I make the big salad. The cheesy side of Friday night pizza . . . My half is low-cholesterol, no-cheese. Our boys are grown and gone with children of their own now. They have also graduated to more sophisticated fare in addition to pizza. Mom and Dad, however, are still indulging in teenage junk food such as pizza, hot dogs and hamburgers at least once a week while focusing the rest of the time on a diet of fresh fruit and vegetables, broiled, grilled or baked lean meat, poultry and fish. Pizza man and I continue another part of the tradition, started one rainy night when we “picnicked” with our two sons on the floor in front of the TV. Between setting our “table” and tossing the salads, I sampled the leftover pizza sauce still warm on the stovetop. Hmmmmm. . . was that difference I was tasting from a weird onion or some new ingredient husband was experimenting with? Seemed like there was a hint of my Thanksgiving cornbread dressing (stuffing to those who didn’t grow up in my area of Mississippi). Then I saw the little red-topped oregano container, except that it was a red-topped container of poultry seasoning. Pizza man is going to have to start wearing his reading glasses during his culinary endeavors! And, oh yes, I ate every bite, weird but not so bad, especially since husband had served up an alfredo dipping sauce, also from scratch, for the crusts. Yum! So much for low-cholesterol! This pizza looks so good, I love thin crusts! How great that your husband can cook! what a funny story! It reminds me of the time my friend fried the potatoes in apple juice instead of oil! Hope you are having a good weekend! If by "sophisticated" you mean frozen, then yes, I confess. You have a very creative Hubby there. Maybe he discovered a new flavor for a food challenge.